Two weeks ago we ran an amazing competition with Qatar Airways. Two lucky winners would win 250,000 Qmiles each in Qatar Privilege Club – the biggest mileage giveaway we’ve ever run. Enjoy spending your Qmiles! Thank you to the team at Qatar Airways for providing such a great prize. 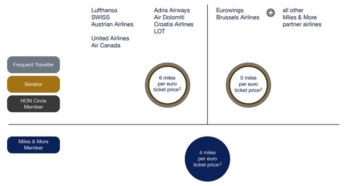 In what may be a model for BA’s upcoming Avios revamp, Lufthansa’s Miles & More scheme moves to revenue-based mileage earning for tickets issued from today. Existing bookings are not impacted. In theory, it is meant to be simpler and to reward those who buy more expensive tickets. The € value used is ‘base fare plus airline-levied YQ surcharges’ which means they will exclude Air Passenger Duty (for UK departures) and airport fees before calculating what you earn. This could lead to cheap one-way tickets from Heathrow earning under 50 miles! Codeshares will be based on the operating airline and not the marketing airline. So …. the chart above is what you get, except when you don’t. If you want to earn miles under the old system, you still can! Simply use a third party booking agent or a Star partner such as LOT or United which can also issue Lufthansa tickets. More confusingly, status, select and HON Circle miles will continue to be awarded under the current system. For readers who earn the bulk of their miles from non-flying methods such as credit card spend, there is unlikely to be much difference to their earning. Lufthansa claims that the new system is neutral in terms of miles awarded, which implies that those buying cheaper tickets (with their own money) will be worse off. There is a Q&A and some more information on the Miles & More website here. OT Trialfinders are promoting a Malaysian Airlines sale that is today only. Headline fares don’t look special but there might be something useful ex EU. O/T I have the IHG black credit card. If I spend £ in a hotel indigo restaurant but don’t spend a night there do I get 2x or 4x points on the credit card? Would expect it to be 4x unless the restaurant has an independent card processing system. Its detailed on my credit card as a charge from Hotel Indigo but only 2x points, not sure whether to contact IHG or not….. I would definitely complain, but to Creation. It is them who have agrred to issue the points on the credit card. Ask why just 2 points whenthe Ts+Cs say 4 for use at an IHG hotel. It is 99% likely that Creation does not have the merchant code for that particular hotel in its system as one which should trigger double points. This is really IHG’s fault of course. Unfortunately I lost the code, something like TAJHOTELS20? We saw this, Anika wrote an article and …. I failed to notice the closing date and scheduled it too late, so it was pulled very late one night. Not surprised by the names, which explains why we geographically restrict our competitions. However …. the way it was written implied that there were two prizes FULL STOP. Not two prizes per day. If we’d known it was two prizes per day we would have run it as soon as we saw it. One of my friends in University won 250,000 miles in this competition. He is absolutely delighted… he apparently saw it on Instagram and entered and now he’s Qmiles rich! Cool! do you know where he is planning to go now with these miles? He was asking my advice, I said to use it for Business Class and not to waste them on Economy Class flights. He’s going to run his destinations by me once he gets around it, but he has a Masters degree to finish first, so I can’t see him jetting off anytime soon. We’re all quite jealous as you can imagine! Off topic Raddison Rewards offer emailed as part of the rebranding. Book 2 nights get 5k bonus points, 5 nights 15k, 10 nights 50k and 20 nights 100k points – stay by 30 June. Thanks. On the home page but I haven’t received it. Existing bookings do not count so I need to look at whether I should rebook a Stockholm stay coming up. Knowing my luck the price will have gone up. OT – does anyone know whether I will be able to claim a refund for a pre-paid in PE? I redeemed the flight with Avios but now need to cancel. Conscious I will ‘lose’ £35 but wondered whether I’d be able to get the £46 (!) I paid to reserve the seat. It would lessen the pain somewhat however it doesn’t appear to be reflected on my cancellation options…. You will get your money back for the seat. OT – opened my BAEC app today and have a picture of a birthday cake…… it is my birthday today. I’ve heard of a birthday bonus but in the 3 years I’ve had a BAEC account I’ve never been offered anything. Do they still offer birthday bonuses? Also, as of yesterday I’m now bronze, first for me. Do I get anything for that? 25% more avios, free seat selection 7 days before flying, business class check in. The benefits are listed in the tiers and benefits page on the BA website. How long should it take for points to appear? I managed to transfer 1400 points that were about to expire and Accor says it went through, but my iberia account is still empty. (as is Accor account) Does it normally take a few days or have they got lost ? OT: re Hilton sale which seems to be live, I can’t see any blackout dates mentioned in between April and December. Tried 2 different hotels in Singapore and Thailand for early April and it kept saying the dates do not qualify. Was also asking for 60,000 points when, till this morning, the rate was 58,000. I have two reservations at Helsinki airport booked at their winter sale price. Down now by £30 each night. OT but last night I was going through the Hilton website pricing up some stays and I came across an ‘Amex rate’ which was a rate for people who booked with an amex card. I’ve not come across this before, anyone have any intel on this? Only refers to US Amex issued cards – Google hiltonhoteloffers.com .